Star Mexican forward Cuauhtemoc Blanco will put pen to paper Tuesday on a deal with the Chicago Fire, the club has announced. Blanco will become the third designated player signed by an MLS since the "Beckham Rule" was announced earlier this offseason. It's going to be very interesting to see how Brighton native and Chicago head coach Dave Sarachan handles the potential powder keg in the Fire locker room that the team has just acquired. 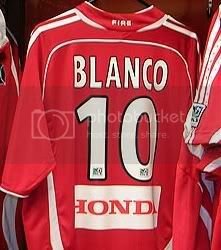 Blanco could make Preki's job of handling Amado Guevara and Bruce Arena's job of handling Clint Mathis look easy. Red Bulls still trying to make moves? The Red Bulls have added Clint Mathis, are reportedly trying to add Aston Villa forward Juan Pablo Angel, and now may be going after Marcelo Salas. Ives Galarcep has this latest rumor in his blog and it's interesting that this rumor is popping up after the Angel rumor has been simmering for a while. Now there are a ton of reason that this won't happen (LA only owns 1 designated player slot currently and they used it to sign Beckham, they'll need a second (and final) designated player slot in 2008 for Landon Donovan, and will AEG spend the money that Zidane will want to sign with MLS? ), but you have to admit that this would be an amazing signing if it were to happen. The best reason for this move would be to allow Beckham to slide out to his natural spot wide right and let Zidane control the middle of the park for the Galaxy. Which USNT will Michael Bradley play for this summer? Apparently U-20 MNT head coach Thomas Rongen isn't feeling as confident about having Michael Bradley with his team at the U-20 World Cup in Canada this summer. Bradley looked really good with the USMNT versus Guatemala and Ecuador and may get a call into the USMNT for the Gold Cup and/or the Copa America this summer which just so happen to be around the same timeframe as when Rongen would be looking to have Bradley with his team in Canada. Greg Ryan has called 32 players into the latest USWNT residency camp at the Home Depot Center in Carson, California. The team will be in Carson for four months when they break at the end of July. The team will then have a series of tune up games and camps in August ahead of the Women's World Cup in China which kicks off on September 10th. Rhinos women's head coach Peter Amos talked about going after a former USWNT player when he was on Kick This! on Saturday. When pressed about who that player might be, all he would give up is that he feels that goalkeeper is the most important position in women's soccer. Could be in the mix: LaKeysia Beene (2001 WUSA Goalkeeper of the Year), Siri Mullinix , Emily Oleksiuk (Penn State alum), Jaime Pagliarulo , and Saskia Webber (Rutgers alum and from NJ).